« New Blue Sky Patterns! This entry was posted on Thursday, January 20th, 2011 at 2:43 pm	and is filed under Uncategorized. You can follow any responses to this entry through the RSS 2.0 feed. Both comments and pings are currently closed. 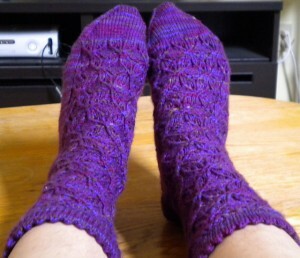 I knit a pair of socks out of the gourmet crafter sock yarn quite a while ago – my favorite socks ever! And yes, it has a hint’o’cashmere too just for some decadence.